Do Visual Resumes Work for Job Hunters? I’ve been exploring the idea of a visual resume, after having to create a document that showed a quick overview of the type of work I do. I designed a mini-portfolio called “Six Fresh Brands” that shows thumbnails of six corporate brands I’ve done, with my skills categorized into three segments to create a simple 3 page pdf. I have since found so many neat ideas online, from people trying to creatively communicate what they have done and can do, and companies trying to help users create a visual cv. It can be so difficult to show the scope, the depth, and the breadth of a professional’s skills over a period of time. One tool I learned about that helps people create a visual resume is called Wordle. If you like playing with graphics and text and colors, this excellent Java-based web application will occupy you for hours. The colors and layouts are all customizable, and the designs it creates actually look good. You take the text from your resume, copy and paste it, and then play with the output until you’re satisfied with the results. 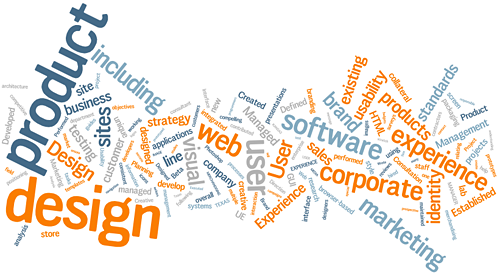 Here is one version of my resume in Wordle form… does this word cloud approach communicate capabilities effectively? You could design so many cool pieces with this art… like a blog header or presentation cover. I just love Wordle! 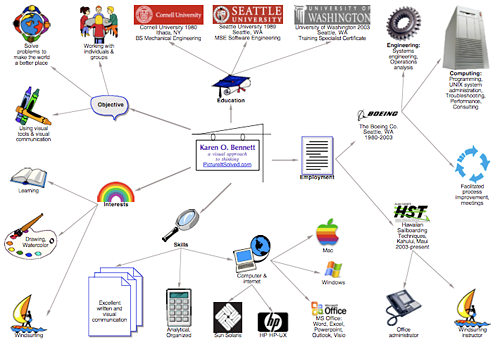 Karen Storer is a visual thinker who presents information using maps and diagrams, so it only made sense for her to present her resume in the same way. Can you picture her solving your communication problems like this? Do Diagrams Help Depict Capabilities? 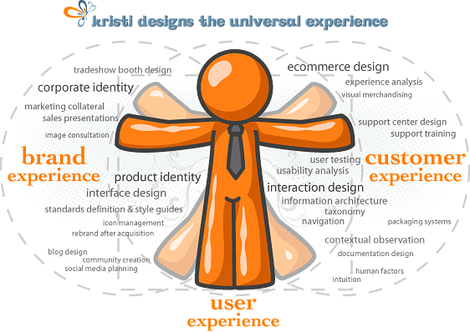 I also took a stab at using a Venn Diagram of my “universal experience” concept as a visual resume. What’s missing in this image is any sort of dates or companies… but would this add anything to a traditional resume, because you can see a lot in a glance? Some folks have used Slideshare to create moving graphic resumes. Alihadi has created an autobiography that made me laugh, as well as educated me on his work history. 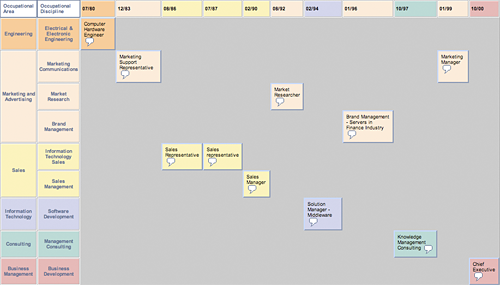 NavAgility is in the business of visual timelines, which can be used to depict a person’s work history. I believe you can drill down into the different work experiences shown, and get the full-blown text of that job history, making this more like an interactive site. But, Do Visual Resumes Work? Some design professionals expect their portfolio to serve as a “visual resume.” But portfolio images are typically just work samples, unless dated and laid out chronologically. What I want to know, is if depicting your work history graphically is effective at getting the attention of the right people, or if they are just novelties meant to amuse graphic-inclined folks like me who find them interesting to study. I assume the traditional resume would also be required, but I’m not sure if that’s correct, if you can fit the dates and companies to depict your work history inside the visual presentation. I’d love to hear it straight from human resource professionals and recruiters, if they’d be willing to take this short survey or leave comments here, to give job hunters some insight. I just followed your linkedin post to your blog. In my capacity as a recruiter I trialed sending visual representations of job seeker information as a way of adding value. My intention was to summarise the key information so that line managers could evaluate job seeker info in a few seconds. I just sent the employer a link hosted the visual resume from my website. I used hyperlinks so that the user could drill down and get the detail of any area that interested them. The feedback universally negative. This may have been partly my bad design, but I think a large part of it was that people get comfortable with a conventional interface and don’t want to make the effort to learn a new way of taking in the info. I would like to give it another go…I have some ideas so drop me an email if you would like to give this a real-life trial. Andrew, that is a good idea, and seems like it would have been helpful to your clients. I was wondering about the drill down issue and whether people would like it or feel it was too much effort. I cannot tell you the number of times I have interviewed where I felt the people had barely even read my resume, or they had just skimmed it, so those folks likely wouldn’t want to see something where they had to put even more effort in. For the candidate, it’s frustrating, because sometimes you see a job description and know you’ve done all that and more, but it’s hard to get the message across in black and white. Andrew, I am designing a visual resume for myself at http://www.visualcv.com/ and you might want to investigate this. I think it can combine and arrange things easier than you were trying to do yourself, and you should be able to get applicants to set their profiles up for you so that all you have to do is make the calls. I can at least anecdotally answer your question. Visual resumes are indeed effective, depending on two things: who you are, and who you’re trying to reach. First of all, let me make a quick distinction between a well designed, well laid out resume and a fully visual resume. I think that everyone, designers included, should have a well designed, well laid out traditional resume that uses proper typography and visual elements to both organize and add visual hierarchy to your resume. A fully visual resume — one like you’ve described that uses infographics and other visual representations to convey work history and other job related information — is simply not appropriate for all job seekers, in my opinion. This again, is dependent on the two things I mentioned before: who you are, and who you’re trying to reach. First, who you are. I’m a graphic designer. I work in visuals. The core of my profession is using design to communicate information. It makes sense for me to have a visual resume because it’s a prime example of exactly what I do. If I’m a CPA on the other hand, then visually illustrating my work history comes with some hazards. If I don’t have the design chops to effectively design something myself that is more effective than a well formatted bulleted list of accomplishments and skills, then I’ve actually obfuscated the information and done myself a disservice in making that information harder for a prospective employer to understand. The alternative would be to have an actual designer illustrate my information effectively. But this is where who you’re trying to reach comes into play. As a designer, most of the jobs I would be applying for are at creative services firms such as design shops or advertising agencies. These are places where other creatives are heavily involved in the hiring process. My ultimate audience is usually the Creative Director, who most often happens to be a fellow designer — a visual thinker. For them, my visual resume is hopefully answering the basic question up front: does this applicant understand design? Having never seen my portfolio or met me in person, my resume alone, hopefully, can convey to a creative director that I “get it.” I’m already speaking his or her language. Something highly visual, in this case, not only helps break through the clutter of the traditional resume format, but serves as the first portfolio piece this prospective employer sees. Conversely, if I’m applying through a staffing agency or for a position on an internal team at a large company, then chances are my resume information must be able to be quickly fed into some sort of computer system. In these cases, I need a Word or even plain text version of my resume that these systems can easily process. I still bring the visual resume to an interview, if I get one, but these types of systems (sadly all too common these days) preclude you from being able to utilize the impact of a visual resume, as whoever is receiving it is likely to only be processing it into a larger, very rigid system, and that’s if it’s touched by a human being at all. In these situations, sadly, it’s only the actual information of your resume that can help you rise above other applicants. The guiding principle needs to be first of all whether or not your line of work warrants the extra effort of a visual resume, and secondly whether or not your audience will be able to understand or appreciate a visual resume. Using the CPA example again, the hiring manager may simply not be visually minded enough to be able to quickly understand the information you’ve so painstakingly illustrated. In that case, it’s not only wasted effort, but actually a barrier to him or her actually understanding your qualifications. Proceed with caution. In my own experience, I can say that my visual resume has opened doors and gotten me interviews I don’t think I would have ever gotten otherwise. It’s my foot in the door for most opportunities, but then again, it is specifically relevant to my industry. The last thing I’ll say is that good design — good layout and typography — would benefit any resume in any industry. There’s nothing wrong with well written paragraphs and bullet points — so long as there’s good typographical hierarchy, tasteful lines, and good font choices.